Brush eggplant with a little oil. Cook eggplant on both sides. Heat up the sun dried tomatoes. Assemble the sandwich, add oregano, salt, and pepper on eggplant. Add the sun-dried tomatoes into eh cheese side of the bread. If you want to enjoy it cold, you can toast the bread or not, and use fresh mozzarella cheese. 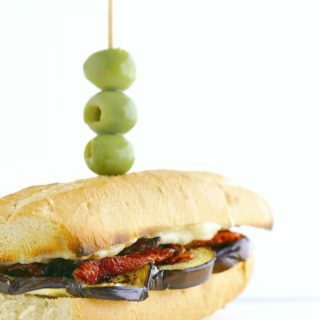 Cooking the eggplant ahead of time and having it in the fridge makes it easy to make a quick sandwich.